PHOTO BY MARK CHAMBERLIN A side of cheese fries with ketchup. 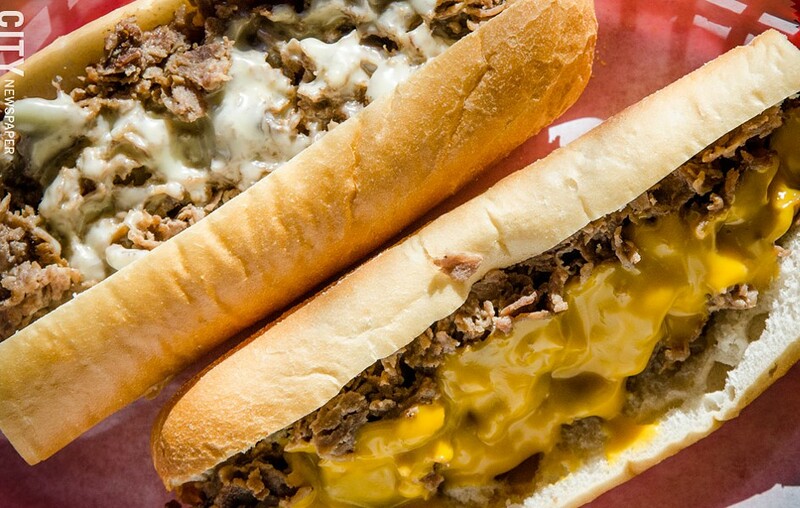 In Philadelphia, the cheesesteak is not just a sandwich. It is an iconic obsession. The city is filled with places to get them, from pizzerias to delis to standalone shops; even gas stations get in on the action. 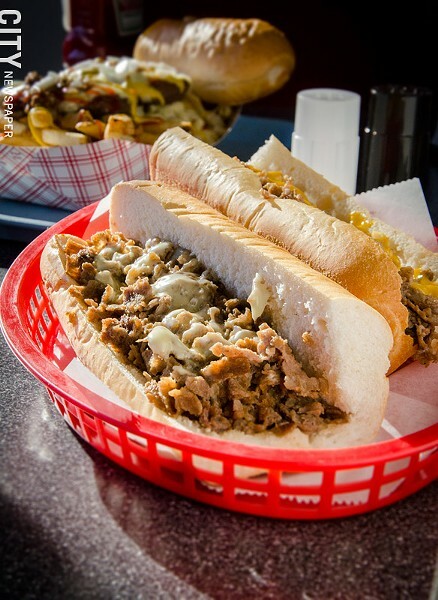 The most renowned cheesesteak purveyors in Philly, however, are Geno's Steaks and Pat's King of Steaks. Like boxers eyeing each other from opposite corners of the ring, they face each other at the intersection of South 9th Street and East Passyunk Avenue. On a nice day — meaning only that there isn't a blizzard or monsoon raging — a line of people snakes around each building. The people in the queues might order "one wiz wit" — a cheesesteak topped with Cheez Whiz and fried onions — or "one provolone widout" — a one cheesesteak made with provolone and no onions — or some other variation on the theme. I've stood in line at Geno's and Pat's, side by side with locals and fellow tourists, eager to eat an authentic Philly cheesesteak. Both were good: meaty, cheese, drippy, satisfying. But, you know what? I like Mac's cheesesteaks better. And you only have to go as far as Fairport or Canandaigua to get one. A cheesesteak at Mac's starts with a hoagie-style roll from Amoroso's Baking Company. Based in South Philly, Amoroso's has been family-owned and -operated since it opened in 1904. "Amoroso rolls are what make cheesesteaks world famous," says Mac's owner Ryan MacNamara. 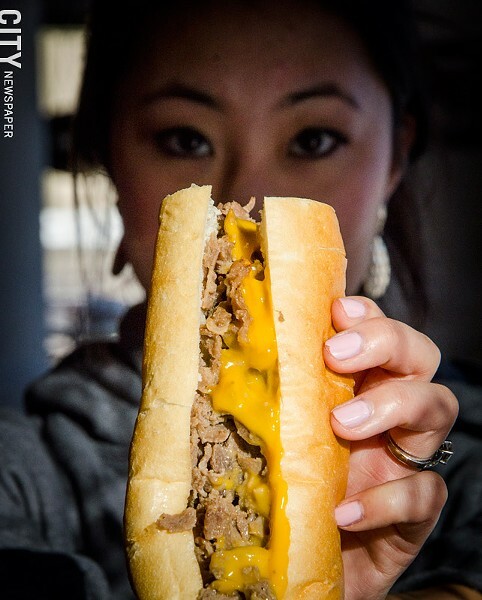 "It is the only way to create a true cheesesteak." At Mac's, a full-sized roll is 16 inches long, a shade lighter than golden brown, with a bottom lightly dusted with cornmeal. It's soft bread; there are no shards of crust that chip off when taking a bite. But for all its softness, it holds up against the ingredients stuffed inside. A Mac plate: mac salad and french fries, topped with 2 burger patties, diced onions, ketchup, mustard and meat hot sauce. Inside the bread is sirloin beef, prepped throughout the day and flavored with an in-house seasoning. (MacNamara didn't specify the blend, but my guess is that it includes salt, pepper, and garlic powder.) The beef is sliced thinly, chopped, and cooked on a flat grill. Though it is cooked until any pink is gone, its thinness keeps the meat tender. Mac's cheese of choice is white American, but triangular slices don't top the sandwich fillings. Instead, the cheese is melted and blended in with the beef, lightly coating each piece. More than anything, this adds moisture and creaminess. While wars of words are fought in Philly over what kind of cheese is the right kind of cheese — Cheez Whiz, provolone, and American are all standards — Mac's is more diplomatic. It will top a steak with Swiss, mozzarella, and cheddar in addition to the other cheeses mentioned. Round out the sandwich with grilled onions, a traditional topping. Opt in or out of the grilled peppers or mushrooms, but don't skip the onions. They're grilled until translucent, but no further, which takes out the full impact of the onions' sulfurous bite but preserves some of the onion's punch. Cheesesteaks at Mac's are $3.79 for a 4-inch sandwich, $6.59 for an 8-inch, and $10.59 for a full, 16-inch sandwich. For added heat, the Philly Hots sandwich ($3.79, $6.59 or $10.59, depending on size) tops a traditional cheesesteak with hot sauce and hot peppers. Plain steak sandwiches and chicken cheese steaks are available, too. Sides are key. Cheez Whiz isn't a culinary darling, but it's damned good on an order of cheese fries ($3.29). It's not gloppy or thick; there is just enough to cover all of the fries, which soften under the Cheez. Shake on some extra pepper and salt for an added pop. Onion rings ($3.29) have a sturdy shell that's fried to a deep, golden brown. They have a hefty crunch and manage to keep the onion from slithering out, maintaining a breading-to-onion balance in each bite. Macaroni salad ($2.29) is made in house daily. Elbow pasta stays firm and is blended with mayo, diced carrots, red onion, celery, and eggs. The egg and mayo add richness, with the raw vegetables bringing brightness and crunch. A Philly Plate from Mac's. Traditionally served with steak OR chicken, the one pictured includes both steak and chicken, cheese, mac salad, onion rings, french fries, hot sauce and served with an Amoroso roll. 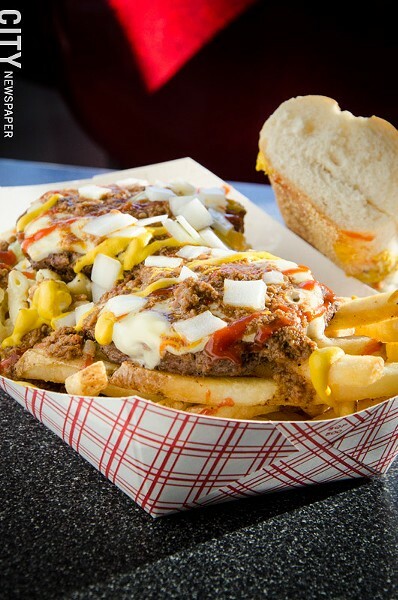 Rochester, like Philly, has its own iconic dish in the Garbage Plate. You probably know that Nick Tahou's Hots has trademarked the name (U.S. Patent and Trademark Office registration number 1708448), which is why other establishments call their versions trash plates, dumpster plates, sloppy plates, or, in a high-low cultural stroke of branding, "Plat du Refuse." At Mac's, there are Mac's plates ($9). A choice of two cheeseburgers, two Zweigle's hot dogs, pulled BBQ pork, or one burger and one dog sits on top of pile of French fries and macaroni salad. It's then topped with Mac's meat hot sauce, crisscrossed with ketchup and yellow mustard, and scattered with raw, chopped onions. Rochester probably argues about what makes a good plate as much as Philadelphians debate cheesesteaks. A well-made plate hits sweet, sour, salty, and umami tastes, which Mac's accomplishes. The meat hot sauce is especially good; it incorporates cinnamon and, cryptically from MacNamara, "other spices." There is more of an emphasis on the cinnamon than in other versions of the sauce I've tasted, and I think there's a hint of clove, too. It's not a thick sauce, nor is it greasy. 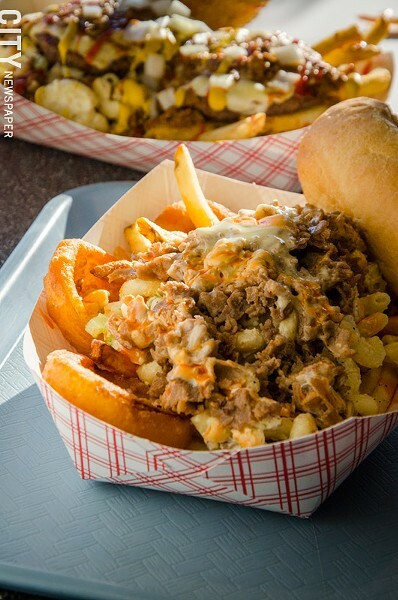 The Philly plate ($9) blends the best of both plates and cheesesteaks: a bed of macaroni salad, French fries, and onion rings are topped with chopped steak or chicken blended with melted American cheese. The pile is then doused with Frank's Red Hot and served with an Amoroso roll on the side. Both the Mac's and the Philly plates are available in monster sizes — double the amount of food for $17. In the spirit of Philadelphia being the city of brotherly love, take along a friend and tackle it together.